I thoroughly enjoyed both individually working on my author blog and also being a part of the collaborative research project for the Writing Lives site. It was an interesting and inspiring process to look into the personal life of my autobiographer, Doris Hunt. I found the prospect of taking on somebody’s life writing a privilege, yet, an unnerving prospect. I found it a big responsibility that as just a student I was given the opportunity to publish my work on a well followed, credible site, like Writing Lives. However, despite the looming responsibilities I gained confidence as I went on and was proud to showcase my work on the Writing Lives site. I found this an intriguing process as it was fascinating to get an insight into people’s journeys and day to day lives in the 20th Century. It was intriguing to learn personal stories in regards to culture, class and family rather than just learn generalisations about the society as a whole. With a different theme to address each week my interest didn’t dwindle! It has been a privilege to partake in this collaborative research project and in turn contribute to public history. I have produced a detailed author blog, intertwined with quotes from Doris Hunt’s autobiography, contextual information, facts and a range of secondary sources that both compare and contrast with Doris’s experiences. Publishing this author blog as a part of public history provides a comprehensive collection of working class authors which are accessible to the public. Participating in this project has indefinitely enhanced my research skills. 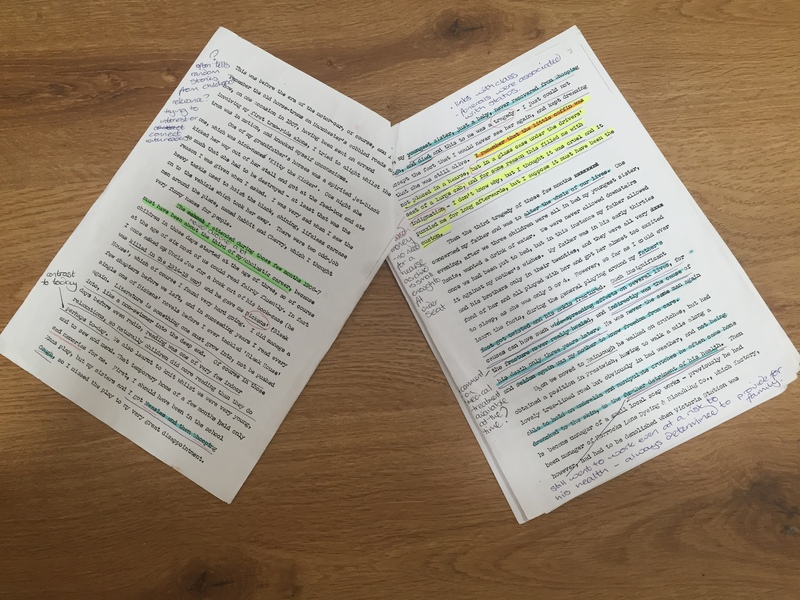 Throughout my author blog I was able to cross reference Doris’s writing with secondary sources in order to add depth to my writing. I backed up any contextual information with relevant texts and when possible offered contrasts and comparisons. Working on a different theme, event or chapter in my authors life writing each week enabled me to explore my authors journey in quite some detail. I have had previous experience of blogging whilst I was a part of the Prison Voices module in my second year. This provided me with research skills and enabled me to analyse both primary and secondary sources for an online audience. I was able to carry certain skills from my previous blogging on Prison Voices across into my work on my author blog as there were similarities between the work criteria on the modules. However, although similar in ways, this module still remained to be a very different experience to the last as we were required to discuss and analyse a different theme or topic in each post. Although I seemed to discover something new every time I read through Doris’s autobiography, I found that when looking for information in regards to certain themes and topics I sometimes struggled to find a sufficient amount of information. On the other hand, another aspect I struggled with was the concern that my blog may become repetitive as there were three very dominant themes which often interlinked within the autobiography. These three themes consisted of class, education and also family. As a working class family, due to the death of Doris’s father Doris had to begin contributing to the family income and therefore work became a priority over education. This was therefore a prominent factor and could be discussed in terms of a range of themes; therefore, I was conscious that it would become monotonous to read. Due to this concern I had to try and make sure that I found new ways to make each posts interesting and engaging for readers. The Writing Lives module enlightened me as to just how much information there can be out there in regards to one source and the module provided me with the skill set to find such research. Producing work for the Writing Lives website required me to make sure that my research was accurate, from reliable sources and correctly referenced. It made me more aware of the fact that the research I was presenting had to be engaging for readers and that it had to be presented in a clear and concise fashion to give my blog a polished tone. I thoroughly proof read each post before publishing them to the site as I was aware that I was presenting my writing on a credible site. I also made sure that I illustrated each blog post with relevant imagery to ensure that my work was aesthetically pleasing and attractive. 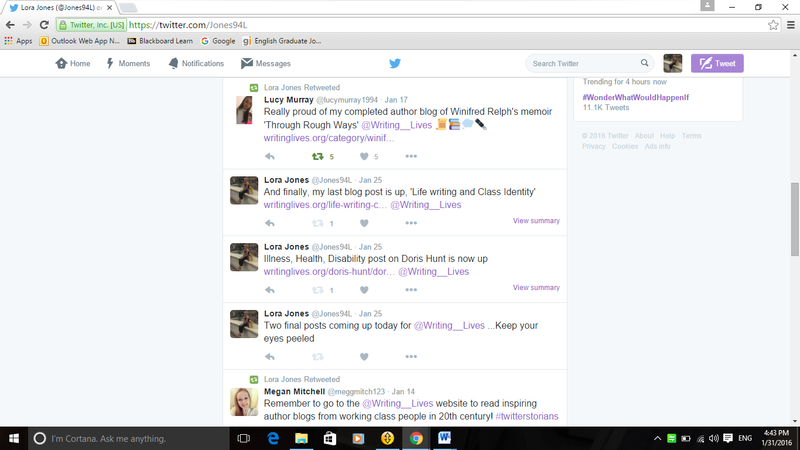 Social media provided me with a great platform to promote my author blog and also the Writing Lives site as a whole. The main form of social media that I used throughout the Writing Lives module was twitter. I found this particularly useful as I was able to post the links to my blog posts and also keep readers up to date with reminders and updates about upcoming posts. The posting of links enabled the public easy access to the site and it was there at the click of a mouse. I have used twitter before in order to circulate my prison voices blog, however, as part of a collaborative research project this year the use of social media seemed much more beneficial as we promoted and supported/ encouraged each other’s work. 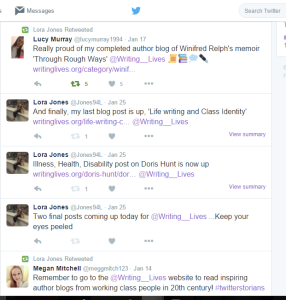 The use of twitter enabled students and the Writing Lives account to support fellow students by retweeting each other’s links to their blog posts. This circulated our work to a wider audience in aid of hopefully gaining wider readership. The use of links, hashtags and images attached to tweets attracted more people and also made them easier to find and consequently activated easier access to the website. Overall, I found twitter a very valuable asset in aid of promoting work. Participating in this particular collaborative research project and working on the Writing Lives website has greatly benefited me. It has enhanced my research skills and has made an impacts towards the way in which I will approach future research. I will now plan to quickly seek out appropriate, substantial sections of information that I deem to be relevant to the topic I am exploring. Not forgetting to clearly reference it, of course! Not only will the work I have produced during this module and the skill set I have built up be an extremely useful asset within the future but they will also look great on my CV. Fundamentally, the most valuable outcome of taking part in this project is this confidence I have gained, hopefully i can carry this confidence and skill set beyond university and hopefully, one day, apply them in a professional manner.